I have a confession: I don't like coffee. I can't stand the taste. I don't even like coffee flavored ice cream...so you know it's bad. My whole life it was just wait until you go to college, you start working, or you have kids, and you'll start drinking it. So you may wonder how I am at all qualified to write a post like this. Well I grew up in the Pacific Northwest, home to Starbucks, Dutch Bros, Stumptown, Seattle's Best Coffee and many more independent coffee roasters and coffee shops. I have been surrounded by coffee my entire life. When I was 13 we went to the Olympics in Atlanta. We drove half way through Atlanta to find the only Starbucks in town and it was their training facility. They had just reached Atlanta. A bunch of 13 year old girls were shouting out their specialized coffee recipes and the baristas actually asked us to hold on while they wrote down the order! Granted this was in 1996 so a lot has changed, but coffee has just always been around. And while I don't ever drink coffee, I drink tea. Chai is my favorite, and hard to find zero waste, but there are so many delicious tea flavors out there. So I understand the caffeine pick me up first thing in the morning or the desire to just have a warm beverage while you mull over the day to come. Unfortunately the habit that is creating a lot of waste. Americans throw away 25 billion Styrofoam cups a year. Just one take away cup a day can lead to 23 pounds of waste. (source). Pods are worse with 55 million being thrown away daily. Despite technically being recyclable the processes for doing so are not widespread so they have to be recycled via a program such as Terracycle (source). The good news is that there are a number of ways to enjoy your morning coffee or tea without creating all the trash. This post contains affiliate or referral links. It is a way for the site to earn advertising fees by advertising or linking to certain products and/or services. I'm going to start with coffee and then move on to tea down below. We'll start with ideas for how to use your existing coffee machines to create less waste, then zero waste coffee makers, how to get beans, and finally we'll move on to tea (which I prefer over coffee!). If you already have a coffee maker you will likely need a filter. Purchasing a reusable filter will be a great way to reduce your waste. There are many different kinds including metal or cotton. If you have a Keurig machine, you may feel that there is no way to create less waste. The whole design of the machine is that you get a little cup and then throw it away. However, have no fear. You can get a refillable pod. My parent's use it and they love that they can use their own coffee (and it's better for the environment). I will caution you to make sure that you get one that fits your machine. There are actually a few different sizes and you don't want to get the wrong one. This option is less desirable because it still produces some waste. However paper, or even bamboo, can be an option in a pinch, and you can put it in the compost with your grounds when you are done. You are putting your coffee grounds in the compost aren't you? Or maybe you are making DIY beauty products. Remember, food does not belong in the trash. However let's say you are in the market for a whole new way to make coffee. There are several different options for coffee makers that create less waste. I'm embarrassed, er, pleased to say that we have several at home so we are able to provide a review of several of these coffee makers. This is an Italian way of making coffee or espresso. Hubby uses the 6 cup Bialetti (makes 12 oz) nearly every day, but they also make larger ones 12 cup ( 25 oz) if you are wanting to make more than one cup or for more than one person. I don't actually like coffee so Hubby is the only one that drinks it. The Bialetti produces a coffee that is between standard coffee and espresso. You put water in the bottom and coffee grounds in the metal filter and put it on the stove. Once the water boils up through the coffee grounds it is ready to go. Hubby uses a medium grind, but some recommend a coarser grind. Hubby says using a medium grind he occasionally has some silt in the pouring part, but it generally stays in the Bialetti itself and not in his cup. French press is another way of making coffee. And I just realized you could brew tea in it too, but I've never used it for that purpose. You put the coffee grounds and hot water in the container. You'll find your perfect recipe. Hubby just eyeballs it, but uses roughly a heaping tablespoon per cup of water. Then once the coffee has percolated for your desired length of time (about 3-4 minutes), you push the plunger down to trap the grounds and pour off the coffee. You'll want the water nearly boiling and you'll want to use a coarser grind of bean so that it stays in the bottom rather than floating up in your coffee. To make cold brew it's very similar to a French press in that the grounds and water come in contact with one another and then you separate them. However with cold brew they steep in cold water like the refrigerator. It is supposed to make a less bitter cup of coffee. I like this one because it uses a mason jar or this one looks like a cool science experiment! Of course you can always just use your own filter or a cloth bag to prevent the grounds from mixing in. This is more like a traditional coffee where the water only has quick contact with the grounds. Using a reusable filter makes this less waste. You can make individual cups with this, or get a whole apparatus or just the filter. This is the most expensive option, but if you are really into coffee an espresso machine might be worth the price. These mugs are great for on the go. You can make your coffee at home and then take it with you as you go about your day. Carrying it with you also helps that when you go to a coffee shop you can ask if they can make it directly in your mug and not waste the cup. I'll warn you some coffee shops are better about this than others. However, as you develop a relationship with a particular coffee shop, especially if it is a local shop versus a large chain, you may be able to nudge them toward less waste. This is the best travel mug. Hubby got it as a gift from mother in law a couple years ago and it's the only travel mug he uses. Both he and my mother in law rave about how good it is. I like that it is easy to clean and we can even put it in the dishwasher. I prefer to use a ceramic mugs so I can put it in the microwave. I think it comes from the fact that I prepare tea and at work we don't have a way to really heat water or milk other than using the microwave. I feel like the silicone top makes me nervous, but once it is on fully it really doesn't leak. I wouldn't go dropping it or trying to flip it over, but it does prevent spills while drinking. Loose tea is best. You know there is no plastic lurking in the bag, however that means that you have to have your own filter to steep it. Hopefully you have a local supply of package free tea, but if not this might be an option. It looks really delicious! I have this mug that you can steep the tea in the mug. It's very handy. I like the mug, but the fact that the infuser fits perfectly within the water is a huge advantage. Plus, I think it increases the surface area so more of the tea can be brewed. Of course you can get a traditional tea ball to use with any mug you already have. 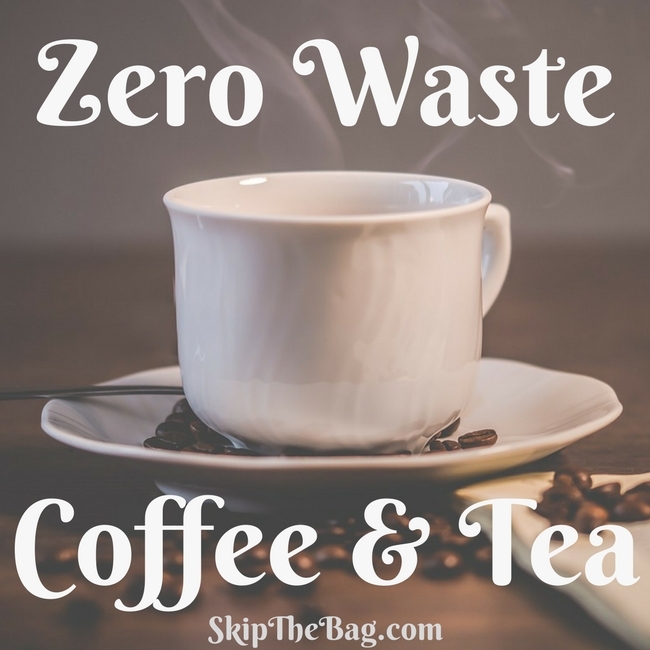 So there you have my list for zero waste coffee and tea. Don't forget to compost or use the coffee grounds to make awesome DIY scrubs. What is your favorite way to have your morning beverage? Looking to create less waste? 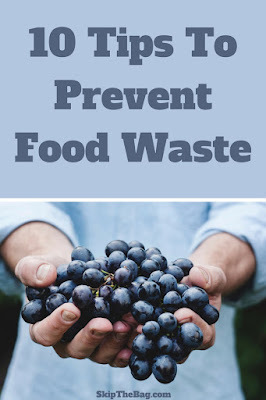 Check out this post on ways to prevent food waste. I adore coffee! I grew up drinking it because my parents were big coffee drinkers. I am so happy to say that I recently acuqired an old percolator which makes fantastic coffee and has a steel basket, so absolutely no waste! I compost my grounds and recently found out I can compost my tea bags as well, when I partake. I use an electric percolator--similar to the Bialetti but plugs in instead of going on the stove burner. I love it! Last year I wrote an article about why not to use K-cups and the price comparison astounded me! It's amazing that people will pay so much more money to make more garbage. Who says being eco-friendly is expensive? I tried finding a steel reusable coffee capsule, but they don't make them yet for the brand I bought (it's a supermarket brand, and it was the cheapest in the market). However, I find that I can reuse the plastic, supposedly discardable capsules dozens of times. So far none of them have ruptured yet. I just buy ground coffee and fill them up - so that's something you can inform your readers about! It has to be the cheapest expresso coffee one can make.